Wat Saket famous as the Golden Mountain Temple is also called ‘Phu Khao Thong’. 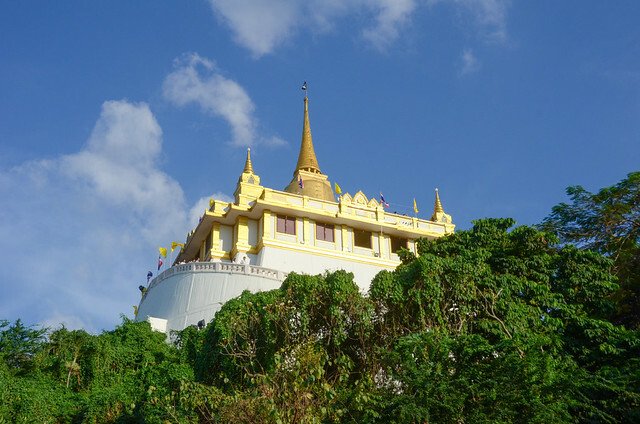 Wat Saket is a Buddhist temple on a low hill covered with luminous gold plating. There exists Buddha relic that constrains every worshiper to get lost into its charmer. Worshipers from almost every part of the world come here every year to devote themselves to Lord Buddha. Annual temple fair in November is held in this temple. You can experience the typical religious vibes where the temple features tall trees and many Buddhist structures. You can find place full of colored lanterns, decorative Buddhist prayer flags during this time. Food vendors with various Thai food specialties of sweets and fairground games and rides for children bring life to the place during the festival. There is also a library, ordination hall, and chapel where you can meditate to meet your soul or read religious scriptures. It is advisable to definitely visit the wonderful temple whenever you step in Bangkok.